"Looks like I picked the wrong week to quit sniffing glue!!" Airplane! is certainly a historic film in the sense that it practically spawned the genre of modern spoof films. Although on the surface it pokes specific fun at the long-running, disaster series Airport, it winds up essentially attacking every element of popular film culture, offending as many people as possible in the process. The revolutionary non-linear and sketch-like humor of Airplane undoubtedly confused audiences at the time, but they were probably laughing so hard they didn't care. This is one of the greatest comedies ever made, and though the Zucker-Abrahams-Zucker team worked together on similar projects afterwards, nothing ever really captured the same kind of edgy brilliance, though their short-lived TV show Police Squad came close. Airplane! tells the melodramatic story of an airliner flight doomed to failure, in that typical, disaster film way. In the early moments, Ted Striker (Hays), a former war pilot, and Elaine Dickinson (Hagerty), a flight attendant, reveal their troubled relationship and Striker decides to go on one of Elaine's flights in order to work things out with her. During the flight, passengers and crew are made ill by bad fish, and Striker must take charge in order to save the day. In the end, the plot means virtually nothing, since it's discarded in order to present the bizarre sight gags and obvious jokes. As a satire of disaster films, it works wonderfully since, like the genre it's lampooning, the story and dialogue are sappy melodrama. Of course, what would a disaster film be without a star-studded cast? Airplane! delivers the goods with a variety of actors, some of whom cut their teeth in B-movies, sometimes painfully so. Peter Graves as Captain Oveur shows a remarkable amount of humor in being able to make fun of himself, since so many of his past roles (especially under Roger Corman) were just as cheesy. Lloyd Bridges actually spoofs one of his own characters, a similar airport manager from the 1970 TV series San Francisco International Airport, and Robert Stack as Captain Kramer obviously pokes fun at his history of playing screen tough guys. Perhaps the true find of this film was in discovering how good veteran actor Leslie Nielsen could be at playing deadpan comedy. The rest of the cast and cameos all fill their required roles with the right amount of humor and intentional stupidity. Obviously, some of the humor is slightly dated, especially references to late 70s ad campaigns and the era's political climate, but most of it is still as good today as it was then. 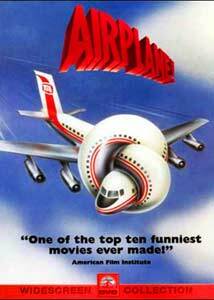 Unfortunately, the spoof genre that Airplane! kicked-off led to some real stinkers, but it's hard to deny that the Zucker-Abrahams-Zucker team were innovators in the realm of comedy, starting with their The Kentucky Fried Movie (based on their original Kentucky Fried Theatre pieces). My only complaint is the rather deceptive PG rating—Airplane! really should be considered an R film, even by 1980 standards, and how it managed to get PG is a mystery to me. Image Transfer Review: An extremely rich, anamorphic transfer breathes some new life into this film. Even though the source print has a few moments of damage and grain, the overall image has astounding clarity and sharpness. Of course, the effects of this great transfer are limited since the film is so purposefully low-budget. The 1:85:1 composition actually adds more to the movie than I expected, renewing my appreciation for the sight gags and awful sets. Colors and black level are impressive and well balanced with the rest of the film. Audio Transfer Review: The new Dolby 5.1 mix is interesting, but probably not what most people will expect. To begin with, the surrounds are barely used. The mix is entirely front channel focused and the only thing really beefed-up is the musical score by Elmer Bernstein. The quality of the center channel information (dialogue, most sound effects) is great, but the mix really isn't anything special. It certainly sounds better than the original mono, though. The French language track uses the original Mono and sounds functional, but is slightly harsh when compared to the 5.1 upgrade. 1 Feature/Episode commentary by Jim Abrahams, David Zucker, Jerry Zucker, and Jon Davidson. Extras Review: The only substantial extra feature on the disc is a commentary with directors/writers David Zucker, Jerry Zucker, Jim Abrahams, and producer Jon Davidson. While entertaining, it has disappointingly long, unnatural gaps. While the 4 men converse, joke around, and tell lots of production anecdotes, the commentary feels very light when it suddenly cuts out for 4-5 minutes. In fact, it seems to always stop right before a famous or favorite scene, as if it's stopping to let the jokes through. Also, turning on the commentary turns on the subtitles automatically as well. The original trailer is also featured, but that's about it. I found this extremely disappointing, especially considering the popularity and historical importance of Airplane!. The presentation stinks, with a cheesy, onesheet keepcase insert and uninspired menus. Beyond that, the disc fails to do any justice to the so-called "director's cut" of the film. Amongst the many cuts of Airplane! made for TV broadcast, some of them featured deleted footage with additional scenes and lines of dialogue (including the popular "Look out for the corn!" sequence). These scenes should have been in the DVD release, or at least added into a deleted footage reel. For a movie actually in the running for the AFI's Greatest American Films list (as well as featured as part of American Movie Classics 100 Years of Movies celebration), I expect at least a retrospective or on-set photos—something in that vein. The great image and sound quality make this a good purchase for any Airplane! fan, but the disc is a bit light on features and presentation. Recommended.